Having waged a successful campaign against the disease, Nigeria celebrated two years without a new case of polio on July 24. However, by early August word came out that a four-year-old girl living in a camp for those displaced by the conflict with Boko Haram had contracted the disease. The resurgence of polio in Nigeria and the renewed efforts to expand vaccination highlight the social, political, and bureaucratic difficulties that vaccination programs face as they seek to achieve eradication, particularly in areas affected by conflict. In this article, pulled from the African Angle archives, Dr. Folake Olayinka discusses various immunization efforts taking place across the continent, and suggests ways for vaccination programs to find greater success in sometimes challenging environments. We may have been caught off guard by the recent outbreak of yellow fever in Angola, but we shouldn’t have been too surprised. 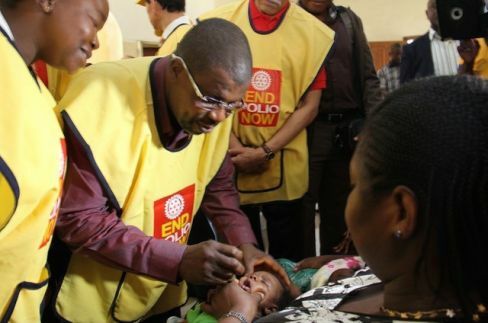 Following declining levels of yellow fever immunization in 2013, subsequent efforts resulted in only 77 percent of Angolan children being immunized in 2014, according to the World Health Organization (WHO). Angola’s most recent outbreak, which left over 200 people dead after spreading across parts of the country, has emphasized the need to strengthen routine immunization systems in Africa. Angola has suffered periodic shortages of the yellow fever vaccine in the past five years, along with a decline in immunization coverage overall. Only 80 percent of children were immunized with a third dose of the diphtheria, pertussis (whooping cough), and tetanus (DPT) vaccine in 2014, down from 93 percent in 2013. The resurgence of yellow fever in Angola is a sign that the country’s routine immunization system has fallen behind. The same holds true for many other African countries, a trend that is threatening decades of gains against infectious diseases on the continent. In 2014, only 10 African countries achieved immunization rates of close to 100 percent of their population: Ghana, Gambia, Lesotho, Mauritius, Morocco, Rwanda, Seychelles, Swaziland, Tanzania, and Tunisia. In recent years, the immunization coverage in the African region has stalled and one in five children still do not receive basic vaccinations. According to the WHO-recommended schedule for immunization, children in Angola should receive the yellow fever vaccination at nine months of age. The immunization schedules recommended by WHO has expanded over the years, as new life-saving vaccines have become available to prevent life-threatening diseases in both children and older age groups. The WHO’s global immunization strategy envisions a world where all individuals and communities can enjoy a life free from diseases preventable by immunization. The organization’s Global Vaccine Action Plan 2011-2020 (GVAP) outlines how this could be done. In 2015, almost half of all deaths of children under age five were caused by infectious diseases and conditions such as pneumonia, diarrhea, malaria, meningitis, tetanus, measles, and sepsis, most of which are preventable by vaccination. Since 1990, there has been a 50 percent decline worldwide in infant and under-five mortality, as well as an increase in the number of children immunized and an expansion of the general population’s access to new vaccines. While it is common to indict family members for not seeking immunization services for their children, I’d argue it’s primarily a failure of the health system itself to reach all those eligible for vaccinations at any age. Health centers are often far from local communities with difficult terrain, and people are unable to travel the distance required to receive services. Some health service providers rude or insensitive attitude has also been identified as one of the reasons caregivers do not continue to come to immunization sessions. Routine and reliable service delivery is not only the backbone of any functioning immunization system, but it is also central to a country’s overall health system. This kind of reliability is absent in many parts of Africa. During a trip to a remote community in Nigeria, where less than 50 percent of eligible children were immunized, I paid a visit to the local health facility, which only offered immunization services once a month. Given the scattered villages and poor roads in that community, it was easy to see how challenging it would be for family members to bring children in to get their vaccinations. The facility lacked accurate estimates of the target population, and vaccines and supplies were frequently unavailable. There were also no regular outreach sessions to provide immunization services due to lack of funds. As I discussed with local staff to explore why children were not being immunized, I looked across the street at a building I had seen as we were driving in. The irony was shocking. It turned out this building was actually the storage unit that housed vaccines for a number of health facilities, including the one we were in. Yet one of the main reasons for providing immunization services only once a month was because they didn’t have enough vaccines to provide more frequent services. How will regular and reliable immunization services be provided across African countries? To start, knowing the number of children and older age groups eligible for the vaccinations in a community will help in making accurate plans and developing operational budgets to provide services. Having reliable regular immunization sessions at health facilities and tailoring these services to the needs of the community will also encourage more parents to bring their children in for routine vaccinations. But it is not enough to simply provide a service. Services must be provided with a smile. Recent studies show that the demand for immunization in Africa is actually fairly high, but that lack of service or bad experience with services reduces community uptake. Friendly service providers go a long way in ensuring that children and their caregivers return on the next vaccination date. Health workers should also provide family members with relevant information during each visit to a clinic, including basic information on the given vaccine, possible side effects, when next to come back, and which vaccines have yet to be administered. A vaccination card spelling out all these key details should be issued for each child. With this type of treatment and reliable service, the parent or caregiver is likely to come back. Equally, when a child or adult who is unvaccinated or not fully vaccinated visits a health facility for any reason, health care workers should check the patient’s vaccination record and administer any missing vaccines. Finally, we cannot wait for caregivers to bring children to us. We must reach out to educate and engage communities on the importance of vaccination in preventing deadly diseases. The health systems must also organize outreaches to ensure everyone has access to services, especially in hard to reach communities and marginalized populations, based on community needs. Recently, a continent-wide conference of African government officials acknowledged that, “broad-based, inclusive growth in Africa is dependent on a healthy population; and strong immunization programs are a cornerstone of robust systems which help achieve universal health coverage, which is critical to helping national leaders achieve their economic and development goals.” The words have been spoken, now it’s time for action. Dr. Folake Olayinka works with JSI in Arlington, Virginia and is a public health specialist with particular interest in immunization, maternal and child health, and infectious diseases. She is an Aspen New Voices Fellow. Follow her on Twitter @joflakes.